Learning how to race isn't a science but a skill, and Naye'Ron Hudson-McGlown, who hails from Hampton, Virginia, will continue to learn that very thing at the AAU Junior Olympic Games in Ypsilanti, Michigan. The young runner, who set a Games record in 2016 in the 800m (2:27.02), earned his first win in the 800m at the Region 5 meet, but he'll also compete in the 400m against other runners outside the state. Stay tuned to see how Hudson-McGlown responds to competition yet again. 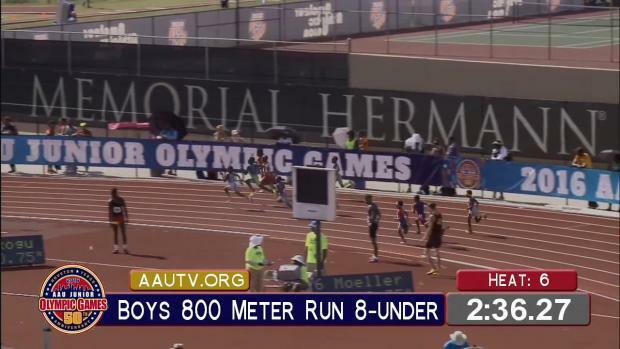 Breakdown: The young mid-distance athlete is just learning how to race at his age, but that didn't prevent him from winning in the 800m at the AAU Region 5 Qualifier in Gloucester, Virginia. He ran 1:03.53 in the 400m, taking second, and went 2:28.92 in the 800m, earning first.